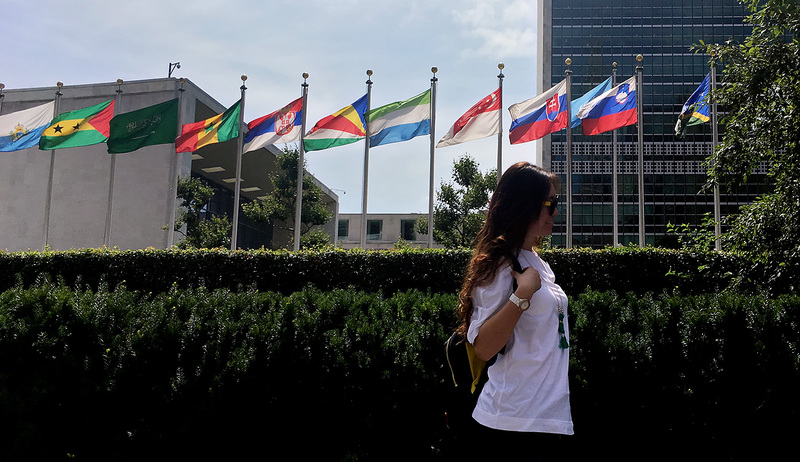 A Chinese tourist poses for a photo in front of the United Nations Headquarters in Manhattan on Tuesday, the same day that the Hague’s Permanent Court of Arbitration ruled against China, saying that according to the 1982 United Nations Convention on the Law of the Sea it has no claim to the island bases it has built in the South China Sea. The Arbitration Tribunal at the Hague regarding the United Nations Convention on the Law of the Sea (UNCLOS) has just made a big splash with its landmark ruling in Permanent Court of Arbitration Case No. 2013-19—The South China Sea Arbitration (The Republic of the Philippines v. The People’s Republic of China). “The Philippines welcomes the issuance today . . . on the arbitration proceedings initiated by the Philippines with regard to the South China Sea,” Foreign Affairs Secretary Perfecto Yasay rightly told the press this morning. His welcoming is rippling across the Asia-Pacific and around the world: This is a great victory for Manila, Washington, and all other parties committed to international law; and for the peaceful, open global system that they rightly support. The Tribunal’s full-length “award” document is a 500-plus-page doorstop, readily digestible by only the most determined of legal experts. Many will be struck by the fact that the Tribunal found Beijing to have violated no fewer than 14 UNCLOS provisions, 6 International Regulations for Preventing Collisions at Sea (COLREGS) rules, and one general rule of international law. Fortunately for non-specialists, the Tribunal’s bottom line is clear: China’s sweeping yet undefined South China Sea claims don’t hold water. China’s “nine-dash line” and related “historic rights” claims have no legal basis. The Spratly features that China claims cannot, individually or collectively, generate an Exclusive Economic Zone (EEZ) for Beijing. China has violated sovereign rights of the Philippines, illegally interfered with traditional fishing rights of the Philippines, and unlawfully created serious risk of collision by engaging in unsafe navigational practices and obstructing Philippine vessels. China has violated obligations to preserve and protect the maritime environment generally, conserve fishing stocks, and prevent Chinese fishermen from large-scale harvesting of endangered species. Experts find major damage to reefs. China’s industrial-scale land reclamation and artificial island construction violates obligations during dispute resolution proceedings and does not confer any additional maritime legal rights to the features themselves. China doesn’t have to like the Tribunal’s ruling, but—having ratified UNCLOS—it is legally bound to respect it in practice. Meanwhile, all parties concerned must remain vigilant and prevent China from destabilizing a vital yet vulnerable region that remains haunted by history; or, worse still, from grabbing with coercion or force what it could not—and now clearly cannot—obtain legally. The award is breathtaking in its scope and the degree to which it gives long-needed clarity to the law of the sea. That it is a unanimous opinion from five of the most learned and experienced practitioners of international law of the sea is especially important. I see three major take-aways from today’s opinion. First, the opinion is a strong reinforcement of the dispute resolution process of the United Nations Convention on the Law of the Sea and also a strong reinforcement of international law over power politics. The tribunal issued a strong rebuke to those who would use coercion to have their way on the seas. In that sense the ruling strongly supports the administration’s calls for peaceful dispute resolution in accordance with international law. But the United States could and should do more. That we stand with Iran and North Korea as one of the very few coastal states to have failed to ratify the Convention should be rectified. Full American participation will ensure our leadership over the future development of the law of the sea and best protect our rights and interests. In rejecting the tribunal’s authority, China has shown it respects only the role of power and not the rule of law. The Senate should ratify the Convention and thereby underscore American leadership and commitment to an international system based on law. Second, The award adds great clarity to the law of the sea. We now have a much clearer understanding of what types of islands are entitled to resource zones and which are not. The ruling will cause many states to have to reexamine their own policies in this regard. We now know with certainty the very limited role history plays in determining resource rights at sea and that the Spratly Islands cannot claim resource zones as a group, both points on which China has relied to justify its behavior. The award strikes down China’s expansive claims to historic rights beyond the convention, its blatant interference with the Philippine fishing and hydrocarbon rights, its unilateral island-building on the Philippine continental shelf, and its wanton abuse of the environment. Finally, this decision is much more than a pyrrhic victory for the Philippines as some will be tempted to suggest. This opinion will have normative power that over the long run will and should affect the way every state thinks about the South China Sea in the future. Ultimately, the ruling’s power is not in its direct enforceability, but in the way it will inevitably alter perceptions about right and wrong actions in the South China Sea. Coercion will no longer stand with moral impunity. Even if indirectly, the opinion should therefore serve as the basis for improved bilateral negotiations in the future. It has significantly narrowed the scope of what is in reasonable and justifiable dispute and therefore should help the parties move closer to a final resolution of their differences. My initial reaction is that the tribunal’s award overwhelmingly favors the Philippines—a huge win for Manila. China’s only lawful claims in the South China Sea would be 12nm territorial seas from land features in the Spratly Islands deemed to be rocks above high tide. China cannot claim an Exclusive Economic Zone (EEZ) from any of the land features of the Spratlys Islands, including the largest, Itu Aba. Nor can it claim any historic rights to resources within the nine-dash line. China cannot lawfully claim historic rights to resources within the nine-dash line. China (and others) cannot claim an EEZ from land features above high tide in the Spratlys, which were all judged to be “rocks” entitled only to a 12nm territorial sea. Mischief Reef was determined to be a low-tide elevation on the Philippines’ continental shelf. China’s construction of artificial installations on the reef violate the Philippines’ sovereign rights. The Spratly Islands as a group cannot generate any maritime zones as a unit. This appears to be an effort to pre-empt a Chinese claim to any maritime zones based on straight baselines that could be drawn around the Spratlys as a whole. What does this mean? The only lawful claim to maritime zones that China can claim in the South China Sea would be a 12nm territorial sea from land features in the Spratly Island that are above high tide. China (and others) cannot claim an EEZ from any land feature in the Spratlys, as none were judged to be islands under UNCLOS warranting such a zone. China cannot claim any historic rights to resources, either, as the tribunal judged that China gave up those rights when it acceded to the convention. In this way, the tribunal’s ruling restricts significantly the scope of maritime claims that China can lawfully make under UNCLOS in the South China Sea. Paradoxically, this may further increase the importance that China attaches to its sovereignty claims over these land features. Gaven/McKenna Reef was deemed to be a rock and not a low-tide elevation. The tribunal claimed no jurisdiction in the in stand-off over Second Thomas Shoal, as it concerned military activities exempted by Article 298. Traditional fishing rights for all states within the territorial sea of features in the Spraltys were apparently upheld, based on the finding that the Philippines had traditional fishing rights at Scarborough. The tribunal did not define what the nine-dash line might mean but only ruled on what it could not mean, namely, a claim to historic rights. The ruling just handed down by the Hague’s Permanent Court of Arbitration in response to the complaint made by the Philippines after the seizure of Scarborough Shoal by the P.R.C. in 2012 now looks destined to radically alter not only China’s interaction with its Asian neighbors, but with the U.S. as well. Because the ruling so undermines China’s claims in the South China Sea region, Beijing finds itself at a critical juncture point: It can either adjust course and seek accommodation with various claimants in these maritime disputes that have put it at odds with not only the Philippines, but with Vietnam, Malaysia, Brunei, and now even Indonesia, or it can double down and become even more obdurate. What mitigates the likelihood that Beijing will become less obdurate and more flexible in its approach to the South China Sea is the reality that having identified these contested islands and rocks as part of China’s so-called “core interest,” it has become trapped by its own conviction that disputes involving the question of Chinese sovereignty are never negotiable. As a result, China’s neighbors and the U.S.—which has treaty obligations with the Philippines, Japan, and Korea, and growing partnerships with other South East Asian countries, such as Singapore and Vietnam—must be ready for a much more rigid, even belligerent, Chinese posture. It will, of course, be the U.S. that will be most immediately challenged by the Hague’s ruling and China’s response. For having had the Seventh Fleet long deployed in Asia and playing an important role in assuring freedom of navigation in the region, the White House will be confronted by some very difficult decisions about how far it wants to go in confronting a potentially aggrieved and even more aggressive China. This will be a delicate high-wire act that must also take into account the importance of the larger U.S.-China relation and the need for cooperation on other crucial issues such as nuclear proliferation (and particularly the fate of the D.P.R.K.’s nuclear arsenal), climate change, global trade, and pandemics. How these other important issues can compete with what surely will be a vitriolic Chinese reaction is far from certain. But suffice it to say, the interaction over the next few weeks between China, the U.S., and its Pacific neighbors will be crucial, for it will help cast the die for future relations in the whole region. Our words matter now as much as our actions. How the United States and the Philippines react will also influence how China responds. The Chinese government and media have repeatedly rejected the tribunal’s jurisdiction in anticipation of the ruling, creating ample space for China to maneuver. On WeChat, Chinese state media are stressing that the best response is to ignore the verdict. So far, Xi Jinping’s government has been highly effective at both stoking and quashing nationalist sentiment over the South China Sea, as I note in a recent book on China’s management of anti-foreign protests. The government has fanned patriotic sentiment through the media but kept it online rather than in the streets. Chinese police intervened when demonstrators sought to protest over Scarborough Shoal in 2012 and repressed anti-Vietnamese demonstrations after Vietnamese protests killed several Chinese workers during the oil rig standoff in 2014. Protests by Vietnamese and Filipino activists have been met with Chinese scorn rather than countermeasures, as I write in a journal article published last week in Security Studies. If we now see Chinese protests over U.S. or other countries’ actions to enforce the ruling, we should take them seriously as a sign of China’s resolve. However the U.S. and its allies proceed, a quiet approach—actions with a minimum of publicity and a clear legal rationale—would be most effective. The more we trumpet China’s defeat or loss of face, the more domestic pressure or temptation the government will feel to respond with more than bluster. What does the ruling change? It does not increase the military strength of any Indo-Pacific country threatened by C.C.P. state expansionism. It will not increase the willingness of Indo-Pacific governments to join in collective security to resist further P.R.C. expansionism. The ruling may, however, strengthen those forces in Beijing that argue that the present international system was created by the U.S.A. to serve the interests of the U.S.A. and therefore is a system that does not serve Chinese interests. China could become more chauvinist, militarist, and revisionist. Or, the decision instead may strengthen those forces in Beijing which have long argued that a Beijing switch from Deng Xiaoping “hide and bide” policies to post-Deng (post 2007-8 Great Recession, understood as U.S. decline and China unstoppable) assertiveness is not serving Chinese interests in the Indo-Pacific but is instead uniting the countries of the Indo-Pacific to join together, including military preparedness, against China in what C.C.P. leaders see as China’s neighborhood. What matters most for war and peace in the Indo-Pacific is the impact of the ruling on the ongoing struggle over foreign policy inside of Zhongnanhai. I was struck by language in the ruling that pertained to the environmental damage done in these waters. This was an often-overlooked element in the Philippines’ case—overlooked because the South China Sea has rightly been seen primarily as a major geopolitical and strategic issue. The ruling finds that the Chinese have inflicted “irreparable” damage to the environment in the course of its building up the various islands, with airstrips and so on. That’s damage done to the coral reef environment, and what the tribunal said was harm “on a substantial scale” to marine life in the area. This is important because China has actually become a major voice on global climate and other environmental issues; and also because this part of the ruling will attract attention and criticism from those for whom the environment is more important, or more interesting, than the geostrategic question of who controls the seas. Beijing made it clear prior to the publication of today’s Permanent Court of Arbitration (P.C.A.) decision that China does not accept the court’s right to rule on its territorial claims in the South China Sea. Such reticence was the product of both Chinese principles and pragmatism. On the first score, China’s leaders always have been wary about granting international organizations too much authority due to concerns about how this might undermine what they view as sovereignty’s foundational role within the contemporary international system. On the second score, they probably anticipated that any ruling from the P.C.A. would be detrimental to China’s claims. It is then safe to say that those in Beijing must not have been too surprised by the substance of the July 12 decision. Nonetheless, it is difficult to understate the extent to which the P.C.A.’s ruling challenges practically every core component of Beijing’s international legal position regarding the sovereign status of the South China Sea. Such a development is unprecedented within the history of this contested ocean territory. It then constitutes a pivotal moment within the conflict there, and may have caught Beijing somewhat off guard in terms of the scope of the ruling. The world is then in new waters in the South China Sea. However, this does not necessarily entail an immediate escalation of hostilities there between the territory’s various claimants. Rather, the ball is now in China’s hands, and much will depend on what Beijing does with it. Will it play by the new rules laid out by the P.C.A.? Or will it move to re-write the game in the South China Sea according to how it sees fit? To begin with, Beijing is likely to want to call something of a time out, or, at least, protest that the call the P.C.A. made was wrong. Thus it will attempt to both downplay the ruling’s significance (in terms of being non-binding), and undermine its legitimacy (in regards to which it is not consistent with international law). Beijing will undertake this balancing act in no small part, as China’s leaders are well aware of the extent to which the decision will aggravate popular nationalist sentiment within the country. To continue with the sports analogy, grass roots nationalists within China are then akin to vocal fans at a sporting event, but in this case such a group not only has a rooting interest in how things unfold, but also can influence the outcome by storming the field (via social protests, online and in the streets). In this regard, China’s leaders likely have real apprehensions about the extent to which emotions might run amuck at the popular level within China, should they either be too bluntly repressed, or overly fanned, by the words and actions taken by the Chinese state. As a result, Beijing is unlikely to pursue policies at home or abroad regarding the ruling that will cause an immediate crisis over the South China Sea. This being said, assuming that the region makes it through the next few weeks without major incident, Beijing is now also in the position where it surely will feel it is necessary to develop a new game plan for re-inscribing its claims to the South China Sea in the face of this ruling. On this front, it is fair to expect greater Chinese assertiveness in these waters. In other words, Beijing is simply not going to forfeit the region and go home. This is where the real danger of escalation lies, as whatever moves China takes are likely to force the hand of each of the other claimants to the ocean waters, and inexorably drag the U.S. more deeply into the conflict there. As raised in other contributions to this conversation, the Tribunal’s ruling is a major victory for the Philippines’ legal claims. What is less clear at this time is the extent to which the ruling will prove to be “a strong reinforcement of international law over power politics” (to quote Peter Dutton, above). As a legal scholar, I would be delighted to see this final and binding legal decision serve as a basis for progress in actually resolving the claims in the South China Sea. Beijing's refusal to recognize the legitimacy of the proceedings, however, does not bode well for the ruling’s ability to generate a long-term solution. In a statement issued earlier today, the U.S. State Department encouraged claimants “to work together to manage and resolve their disputes.” My question for the experts in this conversation is who (or what forum) can facilitate negotiations? What mechanisms can get the Philippines and China “to work together”? The power imbalance between China and the Philippines makes the prospect for meaningful bilateral negotiations unlikely if the two countries sit down alone. And, even if bilateral negotiations take place, what about the claims of Malaysia, Indonesia, Vietnam, and Brunei? Taiwan’s stake in the discussion adds another layer of complexity. Now that we know what the ruling says, it is time for some creative thinking about how the legal decision can ultimately help create a more stable situation in the South China Sea. In the immediate term, let us hope that strategic considerations—including the desire not to ruffle too many feathers prior to China hosting the G20 in September—make for cooler heads as well as that nothing inadvertently goes bump in the night. This one-sided discussion stresses China’s egregious violations of international law but begs the deeper question of, Why? Specifically, why has China upped the ante on territorial claims with its neighbors at a time when it needs all the help it can get in staying the course of economic growth and development? Needless to say, this didn’t exactly dovetail with the “China Dream,” President Xi Jinping’s own mantra that was unveiled soon after he assumed CCP leadership in late 2012. The Dream is about rejuvenation and nationalistic pride—something China doesn't take lightly after its so-called century of humiliation that began with the Opium Wars of the mid-19th century. Mindful of the historic tensions between rising and dominant powers, and with Sino-Japanese frictions in the East China Sea simmering in the background, it is understandable how China might view America’s containment strategy as all the more threatening—thereby justifying a counter-response of its own. Legal skirmishes with the Philippines may well be a proxy for a more significant and increasingly contentious power struggle between the United States and China..
For the record, the construction timeline of China’s land reclamation and the establishment of military facilities in the Spratly Islands started at some point in 2014. Given the forward planning required for such activities, it is safe to say that this more overt phase of China’s territorial aggression strategy probably was formulated during 2013—a period that post-dates America’s Asian pivot. Not by coincidence, it was around the same time when China frimed up its own Asian pivot in the form of its sponsorship for the Asian Infrastructure Investment Bank and its pan-regional One-Belt One-Road campaign. None of this is to excuse China from the findings of the Hague Arbitration Tribunal. The Panel makes it clear – as do the comments above—that China has gone well beyond international conventions and laws in its aggressive actions in the South China Sea. But in pondering a resolution of this thorny and potentially dangerous situation, it is also important to think about how think about why this has happened. Motives are never as one-sided as they are portrayed in public discourse. Who pivoted first? Shouldn’t all those who have pivoted think long and hard about how to lower the heat before the simmer turns into a boil? [Editor’s note: This post was updated at the author’s request to correct a mistaken date in an earlier version]. The sweeping nature of the Hague arbitral award is a well-deserved victory for the Philippines’ legal team. Their creative legal arguments avoided the complex jurisdictional obstacles in their way, and set the stage for a huge legal victory the merits of the dispute. They had a plan, they executed it, and they won big. But I can’t help wondering if the Philippines won by too much? After all, how China reacts to the award is the most important factor in determining the long-term impact of this award. China is, as Jessica Chen Weiss and Orville Schell note, locked in to its own publicity campaign to a policy of maintaining “indisputable” sovereignty in the region. The most optimistic result of the award would be a bilateral agreement between the Philippines and China which gives something to each side. For instance, perhaps China could maintain its facilities on Mischief Reef but it would have to leave Scarborough Shoal. Or China and the Philippines could reach an agreement managing fishing in disputed maritime zones. But the tribunal has just ruled in favor of the Philippines on all of these issues, making it hard for the Philippines government to give away sovereignty and maritime rights that the tribunal’s award grants it. In other words, the award does not open the door to any face-saving way for China to reach a compromise with the Philippines or its other regional neighbors. Indeed the sweeping nature of the award makes it easier for China to denigrate the arbitral tribunal as biased and illegitimate. I don’t disagree with any of the arbitral tribunal’s legal findings, but I am worried that the legal result is going to make resolution of the disputes harder rather than easier. Today’s final arbitral award delivers an unexpectedly thorough legal victory to the Philippines and a dramatic public blow to the legitimacy of China's obscure maritime claims in the South China Sea (SCS). However, China’s loss is not nearly as unequivocal as many assert. We need to note, and repeat, and reiterate, and underscore what the award did NOT do: it did not undermine China’s claims to territorial sovereignty over islands and rocks, nor did it delimit any maritime boundaries. It also did not invalidate the “9-dashed line” itself. Rather, it denied that the puzzling map and associated Chinese practices— including fishing, naming, surveying, administrative actions, and other historical usage—could serve as bases for China to claim “historic rights” over resources in the SCS. There is no legal reason China cannot continue to use the line as a partial basis for claiming territorial sovereignty over the islands and rocks that it circumscribes—in fact, the arbitrators basically invite China to do so (see para 272). China appears to have anticipated this outcome, quickly issuing a statement that conspicuously separates its claims to historic rights from its claims to sovereignty based on the 9-dashed line (see Andrew Chubb’s excellent, if speculative, analysis on this point). Certainly, we should still expect to see the map for some time to come, and perhaps will even see heightened fishing and law enforcement activities along its distant southern frontiers. Diplomatically, however, Beijing appears to be positioning itself to salvage the “core interest” part of the claim (and save some face) by dispensing with some of the more extravagant possible interpretations of the map. Prior to the award, amidst Beijing’s frenzied (and ongoing) counter-arbitral PR campaign, the Ministry of Foreign Affairs began to describe its fishing and law enforcement activities in the area surrounding Indonesia’s Natuna Islands as justified based on non-exclusive “traditional” fishing rights of some kind (see, for example, P.R.C. M.F.A. Spokesperson’s Regular Press Conference on June 17, 2016 ; P.R.C. M.F.A. Spokesperson’s Regular Press Conference on March 21, 2016. This relatively modest statement is worlds away from the maximal interpretation of the line as a claim to full sovereignty, and substantially less ambitious than the claim to exclusive sovereign rights so thoroughly debunked in the award. It is also consistent with one underappreciated aspect of the award, which affirms the possibility that many states hold traditional fishing rights of some kind within the territorial seas (i.e., not beyond 12 nautical miles) of disputed features. This is by no means the last word we will hear from Beijing on the subject of the 9-dashed line (though they might do well to stop screeching about it and quietly start “negotiations and consultations” as repeatedly promised). There is, however, reason for hope that the award may stimulate meaningful discussion among the parties about how to peacefully allocate the space and resources of this vital sea. Beijing will be hard-pressed to put the 9-dashed line into service as a claim to maritime rights as a starting point for future negotiations: the award makes it a non-starter in any bilateral or multilateral setting, and the decision is binding and final (i.e., no appeal). It remains a plausible starting point for negotiating sovereignty claims, though, and could be bargained away piecemeal as China recognizes its superior interests in strong relationships with its neighbors. The current P.R.C. administration may not be in a position to enter into such talks, but this award paves the way for Deng's hopeful, "wiser generation" of Asian leaders to find a reasonable and equitable solution to these troublesome disputes. The tribunal decision is, as everyone knows, unenforceable—there is no international body capable of materially sanctioning China for its defiance—so whatever consequences she faces will necessarily be reputational, whether domestic or international. From what I’ve seen so far, domestic reactions have been overwhelmingly nationalist, and therefore strongly supportive of the government’s stance. The more interesting question is what China’s international reputation calculus looks like. There are two primary factors here that can affect China’s international reputation: first, its geopolitical strategy in the South China Sea; and, second, its general approach towards international law. The former has, of course, become significantly more aggressive in recent years, but its buildup has been slow enough that its reputational consequences have, in all likelihood, already taken effect. Today’s incident is simply a continuation of a general trend. One could argue that China lost an opportunity to appear more conciliatory, but was anyone really expecting a sudden Chinese shift towards conciliation in the first place, especially in such a public and precedent-setting manner—and are we really sure that it’s in her interest to do so, especially when domestic nationalism is taken into account? China’s (apparently) newly cynical approach towards international law is a separate matter. One argument goes as follows: Up until now, China has largely obeyed international law, and has indeed played that as a strategic card against the United States. Its reputation and standing in the international community has benefited, if not outright depended, on its status as a law-abiding international citizen. Now that it has shown a new willingness to defy the international legal order, it stands to lose much of that goodwill. But is this true? First of all, how many Western nations really saw China as a law-abiding international citizen in the first place? One cannot lose a reputation that never existed. This is not the first time that China has, in the Western perception, flouted international norms: the uproar that accompanied its 2014 claim that the Sino-British Joint Declaration ceased to be binding after 1997 is merely one example out of many. Fair or not, the Chinese leadership’s general reputation in the West seems to be one of ruthless pragmatism, and their approach towards international law is likely no exception. Here again, one could argue that the present decision to denounce the Tribunal represents a missed opportunity to improve China's image, but one would also have to wonder whether that opportunity really existed in the first place: If China had accepted the arbitration decision, would the international perception be that it was trying to signal its voluntary adherence to international law, or that it was simply bowing to geopolitical pressure? If other parties already believe that you are a Machiavellian realist, how costly would it be to persuade them otherwise? Furthermore, is it necessarily beneficial for a country of China’s scale to cultivate an image of international law-obedience, rather than that of a realist rational actor? The U.S—which has never ratified U.N.C.L.O.S., and has a long history of rejecting international legal norms when they run against national interests—is widely perceived to be the latter, and arguably benefits from this. When the cost-benefit analysis is otherwise murky, China may simply be learning from the closest “great power” example it can find. The ruling in Philippines v. China could have been a great arbitral decision. That is not what happened, however. The degree to which the panel members overshot their mark is regrettable as a matter of legal doctrine but, more importantly, potentially dangerous in its needless intensification of the dispute. There is of course much that is reasonable in the ruling, for example definitions of “historic rights” that are defensible in terms of U.N.C.L.O.S. doctrine and precedent and that are applied in a coherent manner to China’s claims in this regard. Other decisions, e.g. dealing with environmental destruction, also seemed in line with the panel’s mandate. But we should all be seriously concerned about the misstep taken in part 4.b. of the decision, on the issue of “The Status of Features in the South China Sea.” As I have written previously, there are significant historical reasons why Taiwan and the Mainland agree on the general scope of China’s claims, especially with regard to the island of Itu Aba. With this ruling, the panel has written into non-existence a piece of land that has fresh water, grows year-round crops, carries and supports hundreds of permanent residents, and has historically been treated as annexable and inhabitable “territory” by many states. The U.N.C.L.O.S. treaty was devised in order to help establish peace and cooperation at sea—not to make territory disappear. Yet that is precisely what the panel has done in ruling, unnecessarily, that Itu Aba is a “rock” rather than an island. What nation on Earth would be content to let a panel of five arbitrators tell it, on the basis of specious reasoning and a legal neologism introduced in 1994, that what it views as its pre-existing territory does not even exist? Leaving its ownership in question would be a different matter; at least there would still be the chance for the claimant state to one day have its arguments evaluated. That chance is now gone, and any state that views the territory as sufficiently important (as a “core interest” perhaps) could begin to act desperately. At the very least, as Graham Allison notes, any self-regarding “great power” is unlikely to comply with such a decision. Nor was the actual reasoning used in this part of the ruling at all convincing. The panel, in making the determination whether land features had the “capacity, in their natural condition, to sustain a stable community of people,” decided to improvise a standard based on a totally different question: whether or not there was “historical evidence of habitation or economic life.” In other words, the U.N.C.L.O.S. Article 121 issue of the “capacity” of an island to sustain life was conflated with whether or not evidence shows that it has actually done so. Yet the potential capacity or ability to do something and actually having done so on specific occasions are two completely different questions, which require different kinds of evidence. The test used, in other words, obfuscates the very question it is supposed to clarify. With this act of overreach, the panel has needlessly exacerbated century-old geopolitical conflicts rather than, as they surely imagined, made them disappear. The Hague award in the Philippines vs. China arbitration case is an extraordinary verdict in the history of international maritime law. Never before has an international tribunal in this field ruled in such a lopsided manner in favor of one party in a case of great geopolitical significance. China’s legal experts have quickly raised some serious questions about the merits of the various findings and judgments of the award. These will no doubt be subject to more serious study in the future. Whatever the legal merits, however, the sweeping nature of the award is politically counterproductive. Julian Ku points out that the award is going to make resolution of the disputes between the Philippines and China harder rather than easier. I would add that it would further complicate China’s internal difficulties—already massive— in fashioning a conciliatory South China Sea policy. In the final months before the announcement of the award, there were signs that the Chinese government—at least the Foreign Ministry—was looking for a way out of the embroiling arbitration case. Beijing’s official snub at the case notwithstanding, the Foreign Ministry took it very seriously and staged an exhaustive public campaign to seek international support for China’s position. Chinese diplomats privately complained about the costs of spending so much diplomatic energy and resources over this case. They were hoping that in the event of a more or less balanced award, Beijing could quietly ignore it while starting a new diplomatic negotiation process with the Philippines. This position of ignoring the award while seeking negotiation with the Philippines is clear from two important documents the Chinese government released immediately after the award: a statement about China territorial sovereignty and maritime rights in the South China Sea and a white paper on settling the disputes with the Philippines through negotiation. Both documents mention the so-called nine-dash line map only in passing. Instead, the statement announces China’s readiness to make practical temporary arrangements with the Philippines to reduce tension and seek cooperation. Those documents were clearly prepared beforehand. They show that the Foreign Ministry is engineering important policy changes in this vital area. Now, this lopsided award—so sweeping in nature that it is rejected by both mainland China and the new pro-independence government in Taiwan—has put the credibility of the Foreign Ministry’s efforts on the line, especially in the eyes of growing domestic nationalistic criticisms. The very unfortunate effect of the award is to stir up Chinese nationalism while undermining moderate voices represented by professional diplomats. Whatever the failings of the Foreign Ministry, it is still China’s best hope of shaping a peaceful and responsible approach to the world. I have earlier identified three camps inside China vying for policy influence over the South China Sea: the realists, hardliners, and the moderates. From the perspective of Chinese domestic policy debates, the biggest winner of the award is the hardliners, who have long held that the case is but an American conspiracy against China. The realists’ position will remain secure, although they are likely to be pulled toward the hardliners’ direction. The moderates are now in a very precarious situation, further besieged by attacks from all sides. That’s hardly a desirable outcome for China’s South China Sea policy or for Asia’s troubled maritime order. The tribunal’s ruling and China’s refusal to accept it present a serious challenge not only to China’s neighbors and to the United States, but to the entire international community. While the Philippines see their positions vindicated by the award, China’s vitriolic reactions highlight the risk of a dangerous escalation of this dispute. Skillful bilateral and multilateral diplomacy with China will be needed to keep the situation from spiraling out of control while also defending the principles of a rules-based international order. The United States and its allies in Europe and Asia have to build a broad coalition to deal with China. I recommend a “G7 plus“ format. The G7 states can build on the remarkably clear joint position they issued on the tensions in the South and East China Sea this spring. The G7 should immediately set up a permanent working group, open to participation from U.S. allies in the Pacific like South Korea, Australia, and the Philippines, but also to countries like Indonesia or Vietnam. This group should consist of diplomats and military representatives – and it should also be open to invite representatives from China for consultations. This ”G7 plus“ format would have the advantage of creating maximum leverage vis-à-vis China. The impact of joining shoulders as a group was already visible in the strong Chinese reactions to joint and forceful G7 statements as in spring this year. At the same time, “G7 plus” could create the opportunity for building bridges, with the goal of bringing China back into an international order based on commonly accepted multilateral rules. Anything less than that would give Beijing a pass to wield its military and economic power at the expense of smaller states. Job Number One for Xi Jinping in the aftermath of the tribunal decision is to use whatever combination of public and private inducements is required to get the new Philippine president Rodrigo Duterte to agree to “joint development” of the Scarborough Shoal. This should not be too difficult, as Duterte has already indicated his interest in obtaining Chinese investment for Philippine infrastructure projects. Xi can wait for those negotiations to mature, as long as they are moving in the right direction. With the Philippines raising no objections, China can then proceed with its planned military construction on the shoal without creating a casus belli with the Philippines’ treaty ally, the United States. President Obama reportedly warned Xi that building on Scarborough would be crossing a red line, but that red line disappears when Manila gives permission. Meanwhile, nothing in the tribunal decision will force China to vacate the seven sand islands it has already built and garrisoned. The blow to China’s reputation as a “peacefully rising” superpower clearly does not bother Beijing decision-makers: instead, they think it’s beneficial for regional neighbors to get used to the fact that, as former foreign minister Yang Jiechi once put it, “China is a big country and other countries are small countries, and that’s just a fact.” A scary image is not always a bad thing. China’s ships and planes are there to stay. As signaled by the large-scale live-fire exercises China mounted near Hainan and the Paracels on the eve of the tribunal decision, their presence will increase going forward. As for the U.S., it is likely also to increase its naval and air presence in the region. But under its own Freedom of Navigation principles it has no reason to interfere with Chinese exercises, and the tribunal decision does not give it the right or the incentive to use military force to expel China from the islands it has already built. Neither side has the incentive or the need to trigger a military clash in the near future. Rather, the two sides will continue to circle one another in an increasingly crowded maritime space.